I think the first place I ever rented from(and by me I mean my aunt) was Pathmark. It was one of the original Mega Man Nes games, just can't remember the exact number. First place I ever got to pick out my own game for purchase was Sears (it was Michael Jackson's Moonwalker. I was a huge MJ fan as a kid). The only time I have ever tried the CD-I was also at a Sears. And being wowed by demos of Super Metroid and Streets of Rage 2. Any memories or names of stores you guys want to share? Electronics Boutique was always in stock despite the woes of distribution that plagued the era, the one at a mall I've always gone to had this unburdening freshness that I would no longer feel from GameStop only four years later (2005). Of course back then developers delayed games for the betterment of the final product, rather than seeing how broken or unbroken they can release it in a jiffy. I remember buying some Genesis games like Taz: Escape From Mars from Funcoland, I remember playing Sonic Adventure at Kaybee Toys before they went bust, I remember buying Pokemon Silver and some other GBC games at Electronic Boutique and I remember buying some Dreamcast games from Babbage's. I really liked Funcoland growing up. Sure they ripped you off on games (like any place that buys used games) but they had a bunch of consoles hooked up and a cool design. I wish there would have been one closer growing up so I could have went more often. A couple weeks ago, I was at Toys R' Us trying to procure an early copy of MLB 15: The Show. I failed, but that's not the point. Since I was out visiting my mother, this was the same one that she took me to as a kid. It's changed a bit since then, but I'll always remember the walls and walls of endless video games. Ah, the memories. Did I want a video game, or did I want to get a WWF or Ghostbusters action figure? BTW, I never could find Hulk Hogan. The Toys R Us wall of games photo made my day! 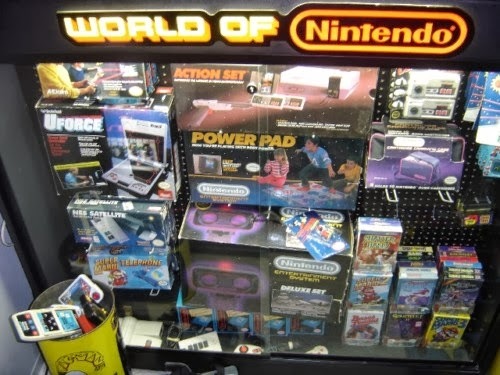 It would be fascinating to see other pics of their game aisles for older systems going back in time. They had something similar for Commodore 64 games and yes, I actually purchased a few C-64 games where I had to take the ticket/receipt to the locked service center at the front of the store. In the summer of 1986 I bought my Commodore, a 1541 disk drive and Bop 'N Wrestle from Toys R Us. Again, a very cool pic! I have very fond memories getting those tickets and taking them to the window where they had all the games. Those were great times. I have very fond memories of going to Toys R Us as a kid and getting toys/games. My dad would always take my there on my birthday so I could buy any one toy. I usually bought junk that I stopped playing shortly there after but the visit was always the most exciting part. I actually had a dream last night that I was in Target perusing the video game section when I saw a small box of games in the corner. I checked them out and they were Atari 2600 games! Atari was back in business and making games for the system again! And these seemed to be big-name titles like Lord of the Rings. I was really excited and started picking through them. Some of them seemed damaged for some reason. Then some other guys saw me and they came over and started looking. Next thing you know it was the most crowded place in the store. That's all I can remember. Wish it would happen in real life! I almost forgot the WWF action figures. Another reason why Toys R Us was the bomb. That's so funny about the Hulk Hogan action figure. I seem to remember now those were hard to come by. I'm pretty sure we had one. Actually, we still might have it.